Don was very young when his mother was poached in the Kruger National Park. He was suddenly alone and terrified. 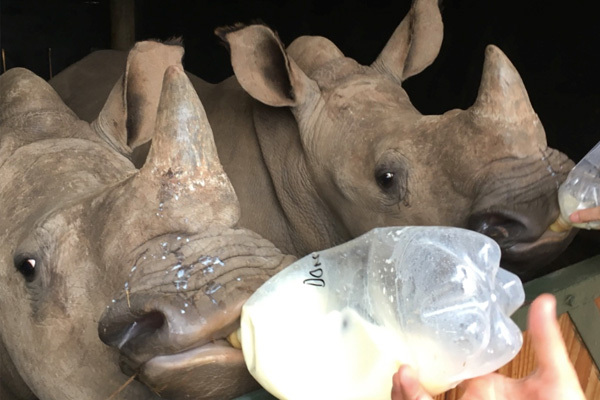 Because baby rhinos are so dependent on their mothers, they recruit replacements in a desperate bid for survival when their mothers are poached, so Don approached a grey-colored vehicle, perhaps mistaking it for a rhino. He leaned against the car, looking for shelter. Don English, head ranger arrived and the baby was flown to Care for Wild. In the helicopter, Don suffered cardiac arrest and the pilot had to make an emergency landing. After three minutes of resuscitation, the little rhino gasped for air! At Care for Wild he quickly became a happy young rhino, sharing his enclosure with Warren and later Oz. When they were transferred down to the big bomas, Lofo, and Twinkle joined their group. The five rhinos instantly bonded. His big buddy now is Oz. They have a bromance and move around in tandem, will eat together, walk together and sleep together. They cry loudly when they are separated. If they’re in a group of 20, they will squeak for one another. Make a monthly donation and share in a baby rhino’s life.